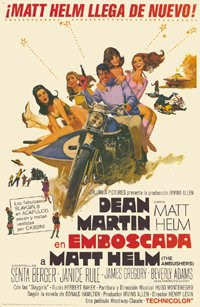 Along with James Bond and Derek Flint, Matt Helm is one of the cinematic world’s best known super-spies. As portrayed by Dean Martin, Helm was an inebriated womaniser who consistently saved the world while delivering a string of boozing and bosom jokes. The Ambushers is the third and weakest of the four Matt Helm films, following The Silencers and Murderers’ Row; and preceding The Wrecking Crew. As with all the films in the series, it is easy on the eye. Along with the scantily clad females, there are plenty of lurid fashions, set designs and colourful lighting. It seems like a large portion of the budget went into making these parts of the movie look great. But it appears no money was spent on the special effects which resemble a ‘sparkler’ on a birthday cake. The pilot of the Flying Saucer is Sheila Sommers (Janice Rule) and she is forced to make a landing in Mexico where she is captured and tortured by the maniacal Caselius. Caselius has a penchant for torture and deviant sexual behaviour. Meanwhile, Matt Helm (Dean Martin) – international superspy and freelance photographer is at the ‘Intelligence Counter Espionage’ (I.C.E.) rehabilitation centre brushing up on the latest espionage techniques. As Helm brushes up against one of the Slaygirls, he discovers the booby-gun. Also at the rehab centre is Sheila Sommers. After he ordeal with Caselius she is traumatised an cannot remember a thing. She is pale white and pasty and refuses to have anything to do with men. That is until some bad guys make an attempt on her life. Matt Helm comes to the rescue at the last minute, and wins Sheila over. But that’s not all he wins. It seems he also wins her hand in marriage. When Sheila comes out of her catatonic state she believes she is married to Matt Helm. It was an old cover that they had previously used on a mission together, and now it seems like that is all she can remember. And as only women can fly the Flying Saucer, she gets to tag along with Helm on his mission to Acapulco. Why are they going to Acapulco? The only clue that they have to go on is that Sheila remembers a jingle for a Mexican beer company called Montezuma. Figuring it must be a lead, Matt is assigned to do a photographic shoot for a magazine, for the Brewery and it’s owner, Jose Ortega (Albert Salmi). And naturally, Mrs. Helm goes along as his assistant. Ortega just so happens to be the number one henchman for Caselius. Caselius isn’t affiliated with any evil organization, like “Big O”. He works for himself and plans to sell the Flying Saucer to the highest bidder. But back to the brewery. Not that this needs to be pointed out, but as you can imagine, placing drunken Dino in a brewery results in our perpetually pissed superspy being, well …more perpetually pissed. The height of boozy excess occurs when Matt Helm falls into a vat of beer. The matt Helm films were never meant to be high-art. In fact they aren’t even low-art. But they do provide a platform for Martin’s humour, and for the girls to show an ample amount of cleavage. What’s wrong with that, I ask? Apart from The Slaygirls who linger in the background of many of the scenes, the film features Janice Rule as Sheila Sommers. Rule, while being a talented actress (maybe too talented for a Matt Helm film), isn’t as strong and charismatic as Stella Stevens from The Silencers or Elke Somer from The Wrecking Crew. But in it’s favour, The Ambushers has the luscious Senta Berger in the all-too-small role of Francesca Madeiros. She too is trying to track down Caselius. After musical scores by Elmer Bernstein and Lalo Schifrin for the first two films, the series turns to Hugo Montenegro for the score to The Ambushers. Montenegro’s swinging tunes are okay on the ear, but don’t really follow the action or the story as it progresses. The music never reflects danger, excitement or romance. It simply bops along happily whatever the scenario may be. It may make for a fine pop album, but doesn’t make for a really good soundtrack to a spy film. At the end of the day, you either love or hate Dean Martin’s drunken antics. If you’re on the negative side, then nothing that I have said here will make you want to sit through this. But for the fans, it’s not the best, but it is harmless fun and provides plenty of opportunities for Martin to trot out a string of familiar one liners.